The Cross House was designed by architect Charles W. Squires. I can only find scant historical documentation, and would love to learn more. Charles Wesley Squires was in born Southampton Township, Long Island, New York on February 5, 1851, and lived there until 1870 when he left for Columbus, Ohio, to study architecture. In 1881, Squires married married Susan Howey, a native of Illinois. 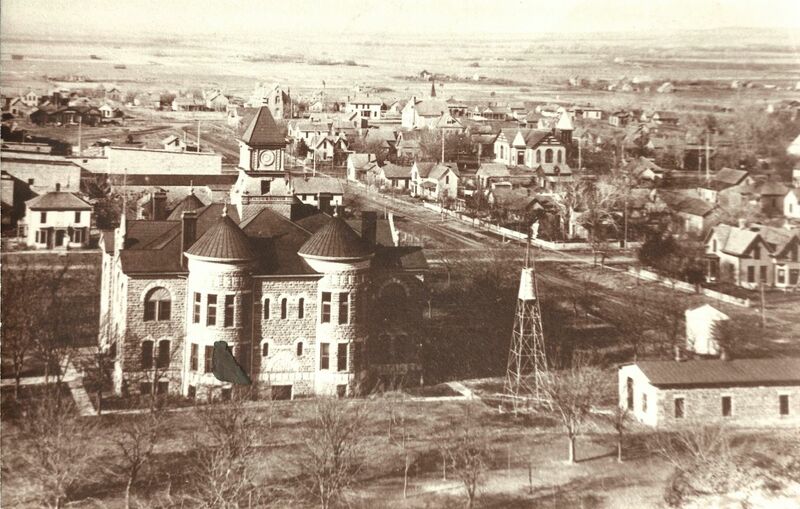 Squires moved to Emporia in 1879. Squires was extraordinarily prolific, and during his career he reportedly designed an astonishing 2700 structures throughout the Midwest. 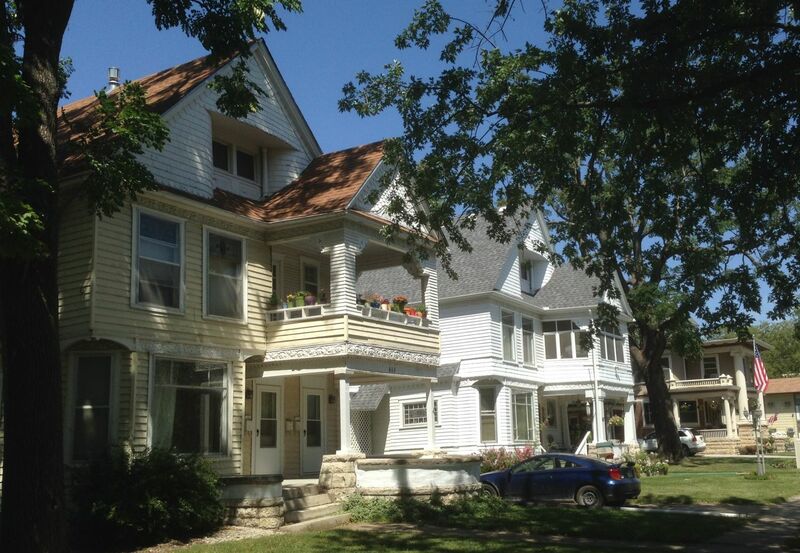 Most of these structures are in Kansas, and Emporia is blessed with more homes by Squires than any other architect. Indeed, on some blocks all the homes are by Squires. Close to the Cross House are at least eight Squires-designed homes. 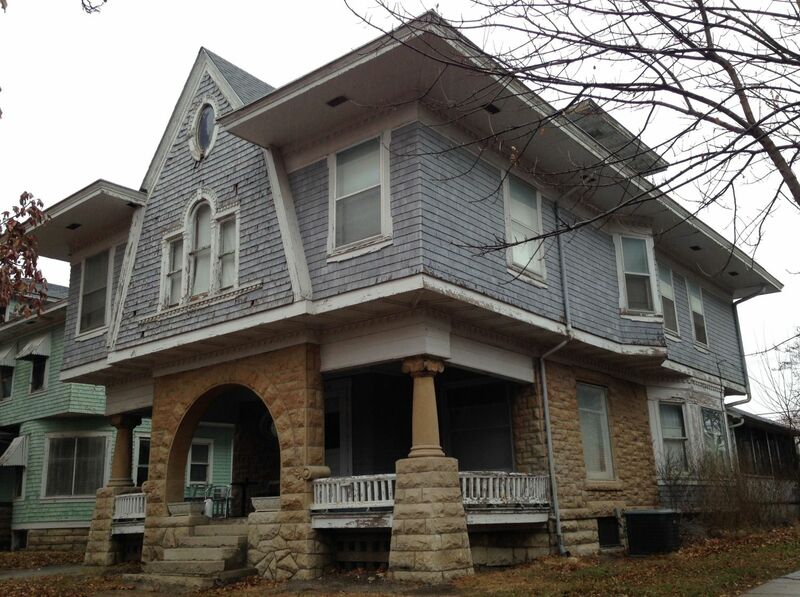 Squires lived at 613 Exchange (just a block from the Cross House) and remained in Emporia until his death in 1934. The more I learn about the work of Squires the more I admire his talent. The man had a gift. After much searching, in December, 2014, I finally found an image of the elusive Mr. Squires, age 77 — courtesy of ESU Special Collections and Archives. 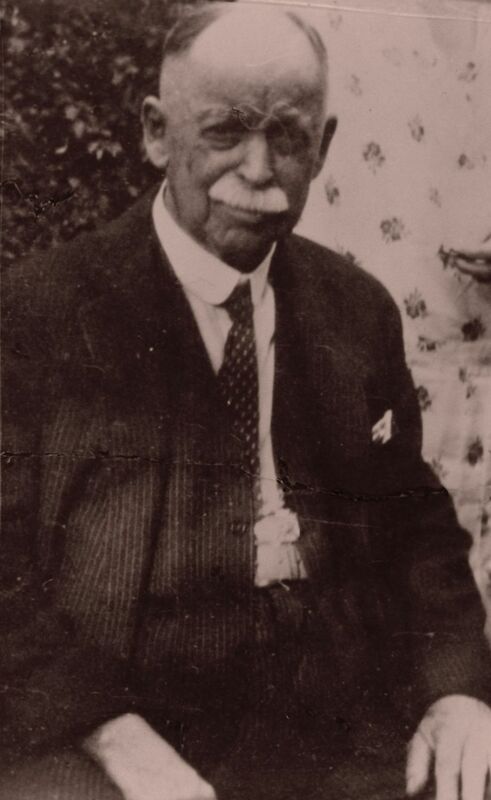 A week later I found another image of Charles Squires! With his (I assume) doggy! 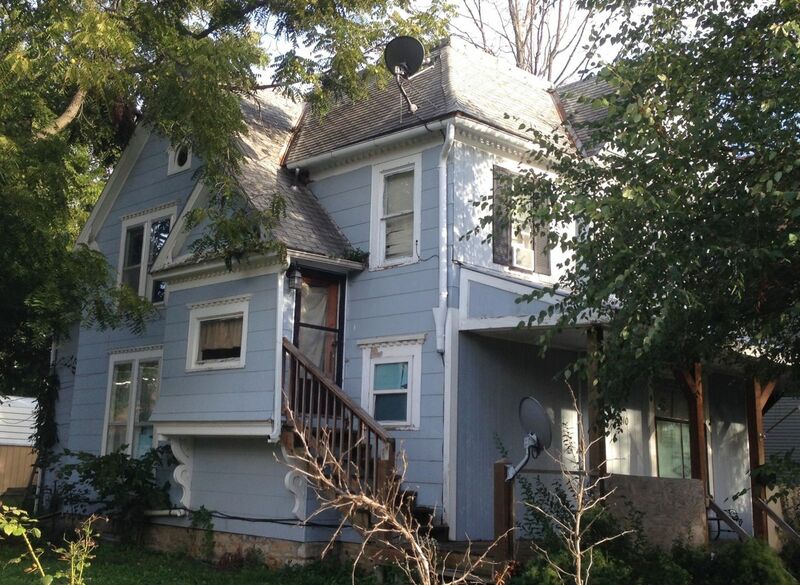 Squires appears to be sitting beside his house at 613 Exchange. — image courtesy of Lyon County Historical Society. NOTE: All the structures below, save four, are extant. 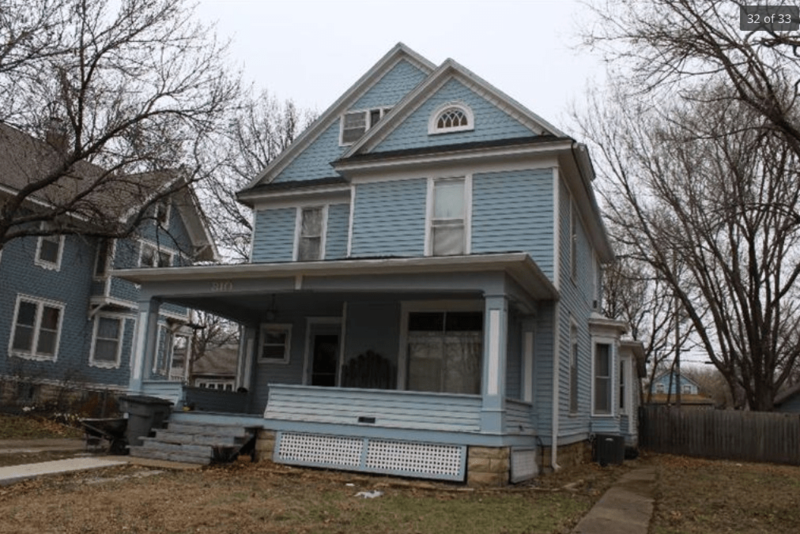 I have not found images of two lost Emporia houses: the Colonel David Taylor House on Garfield Avenue, and the Sergeant House on Mechanic Street. NOTE: I break the post below into two parts. Part One are confirmed Squires designs. Part Two are suspected Squires designs. 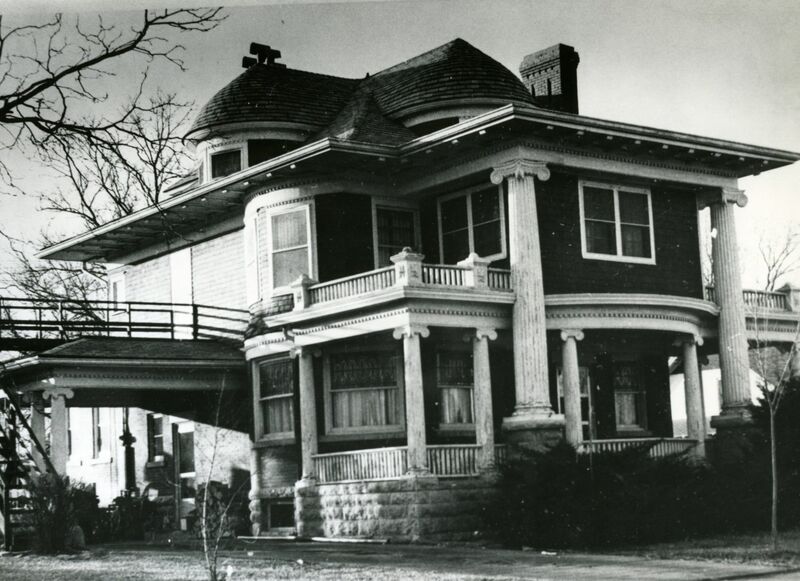 The Cross House (NRHP 2011), 526 Union, Emporia, KS, by Charles W. Squires (image courtesy ESU Special Collections). 524 Union, 1894, by Charles W. Squires. This is the original carriage house to the adjacent Cross House (I purchased both in 2014). 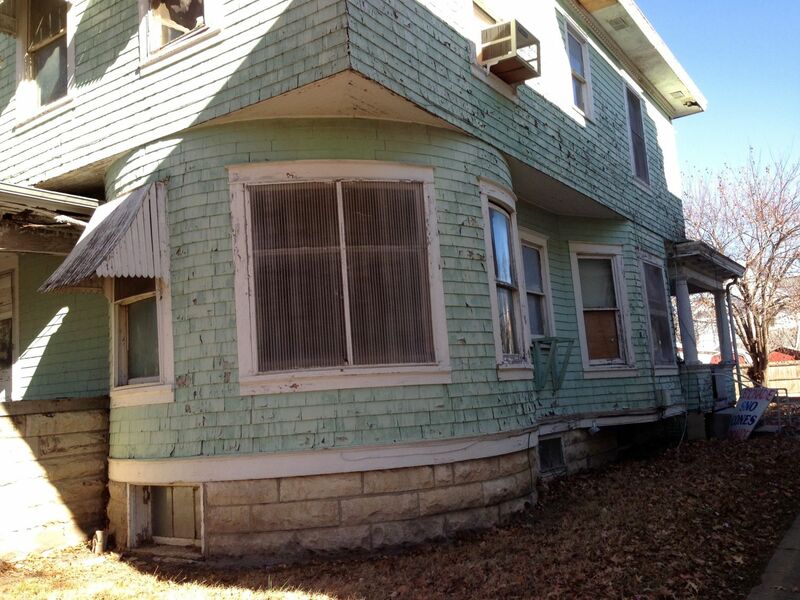 In this 2014 image, 524 is looking a bit tattered as a decaying circa-1915 front porch was shorn off by me. 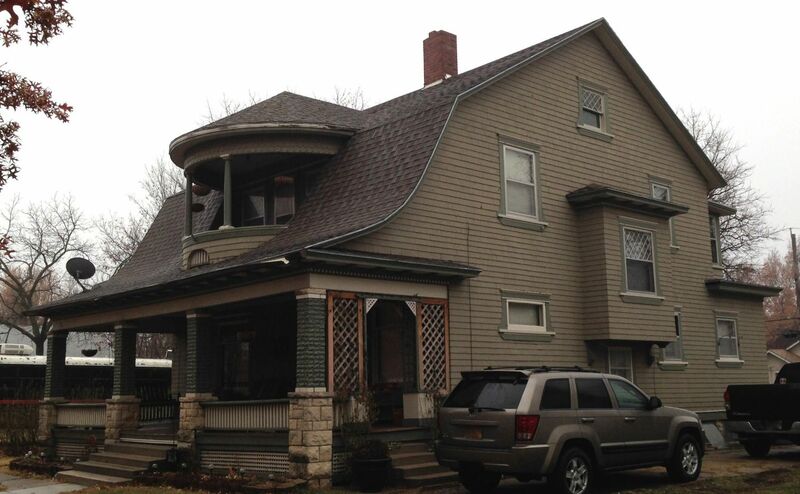 The whole second floor in the image (save the rectangular dormer, in about the middle) is from 1894. All that you see on the first floor is from the circa-1915 renovation, when the carriage house was moved a bit to the west, placed on a full basement, and its barn-like main level rebuilt as a proper home. 524 should look a lot better next year. What a thrill!!!!! A trio of Squires-designed homes. From left to right, 613, 617, and 627 Exchange Street, Emporia. And (drum roll, please) a fourth suspected Squires is across the street! 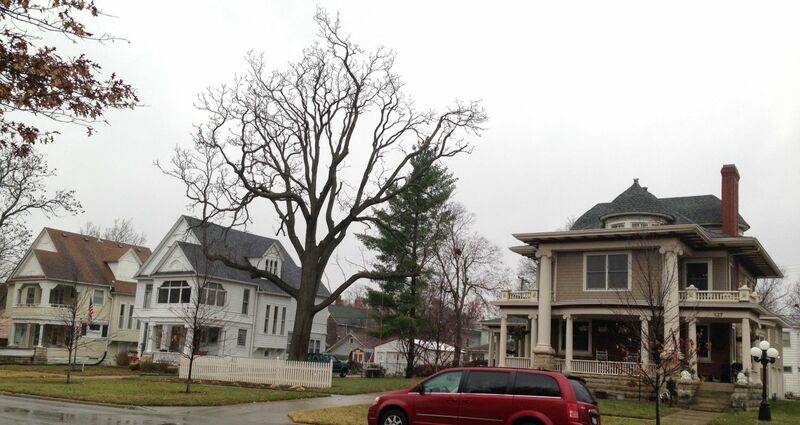 From left to right, 613, 617, and, way over, 627 Exchange Street, Emporia. I had assumed that 613 and 617 were Squires designs based on numerous stylistic similarities to the Cross House, and was delighted to later confirm that the two houses ARE by Squires. Indeed, Squires lived in 613!!!! 617 Exchange, one of the Squires “twins” shown above. LEFT above: the attic level of 617 Exchange. Note the curved walls at each side of the window. Note also the gentle curve of the wall above. RIGHT above: the Cross House. Note the same details. LEFT above: a close-up of 617 Exchange. 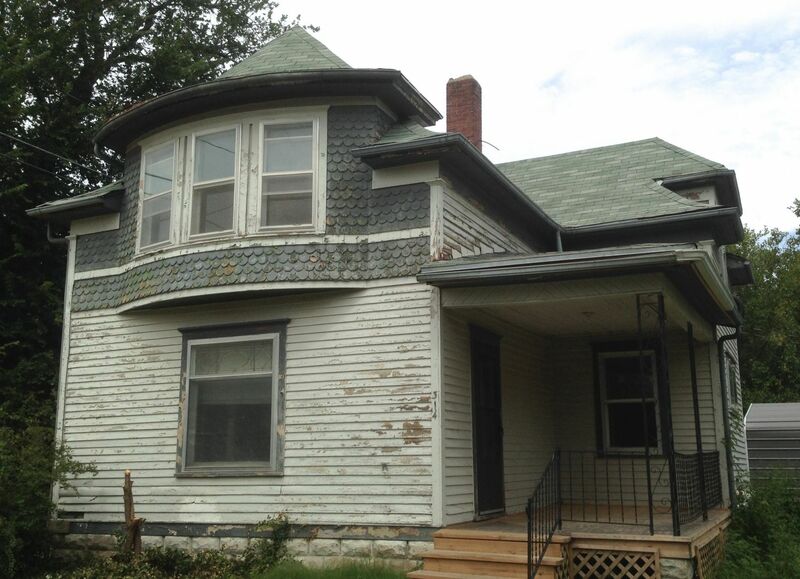 Note the lap siding on the first floor, and shingles above. Note, too, the brackets on each corner, and with scroll-work in between. RIGHT above: the Cross House. Note the very same details as on 617 Exchange (and its “twin” at 613 Exchange). Note also the same details on another suspected Squires design at 526 Exchange (below). 627 Exchange, Emporia, KS, by Charles W. Squires in 1906 (image courtesy ESU Special Collections) . 627 Exchange in color, the northern-most of the “trio”. The home is a block to the east, and one block north, from the Cross House. Note the extraordinary rounded dormers. 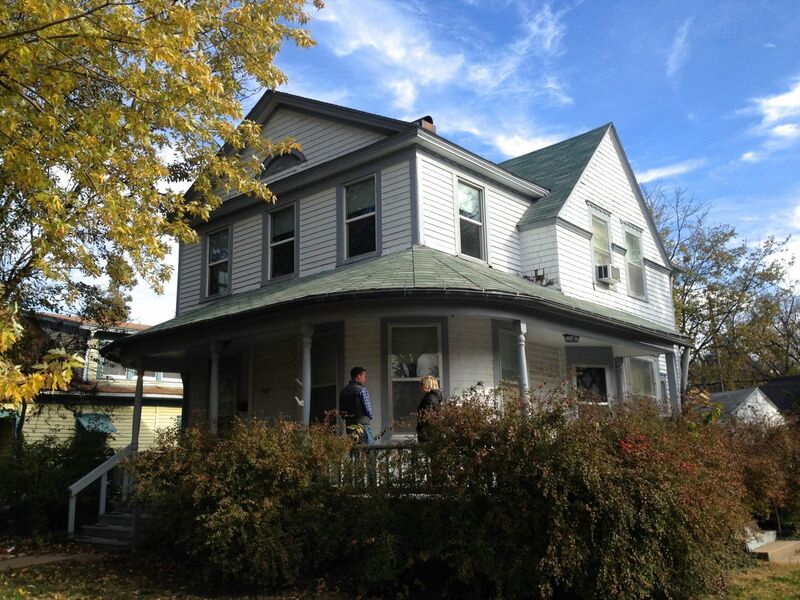 The home is currently owned by Lesley and Eric Gilger. 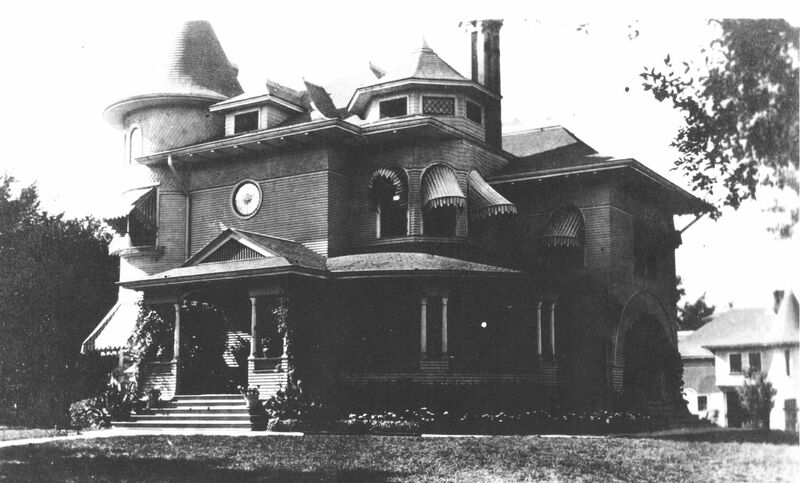 Dr. John A. Moore House (demolished), 1888, by Charles W. Squires. The house was a block to the north of the Cross House, at 706 Union (image courtesy ESU Special Collections). Hallie B. Soden House (NRHP 1977), 802 South Commercial, Emporia, KS, by Charles W. Squires in 1893. 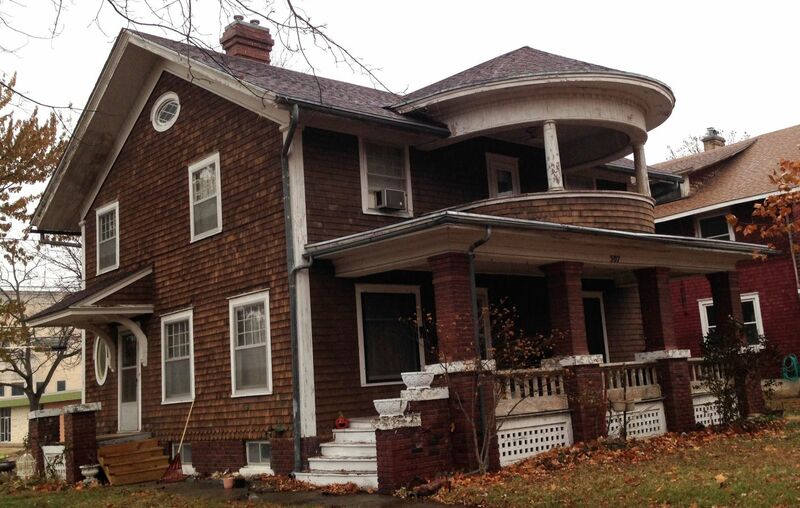 The home is still owned, extraordinarily, by Soden descendants. The Cross House has a similar round window on its south facade. Keebler House (NRHP 1992), 831 Constitution, Emporia, by Charles W. Squires. (NOTE: I suspect that this home may be a Squires-designed remodeling rather than a new build. NOTE: I have a post on this house). A wonderful detail on 831 Constitution. 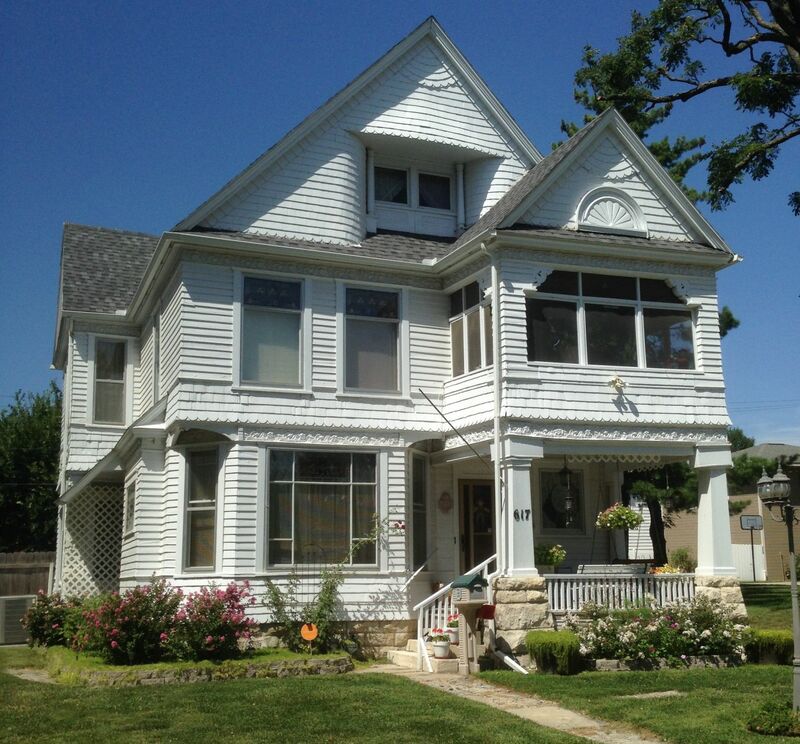 The Ashbel J. Crocker House, 819 Constitution, Emporia, Kansas, designed by Charles W. Squires in 1898. The house is just south of 831 Constitution (above). I have a post on this house. Again, 819 Constitution. 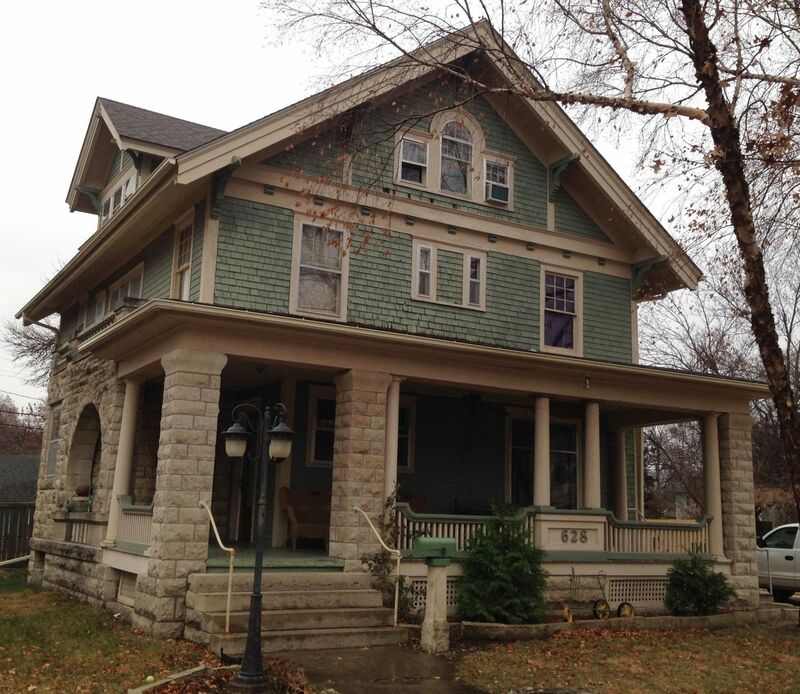 Note the grouped columns, the lap siding on the first floor, and shingles above — all typical Squires touches. Again, 819 Constitution. 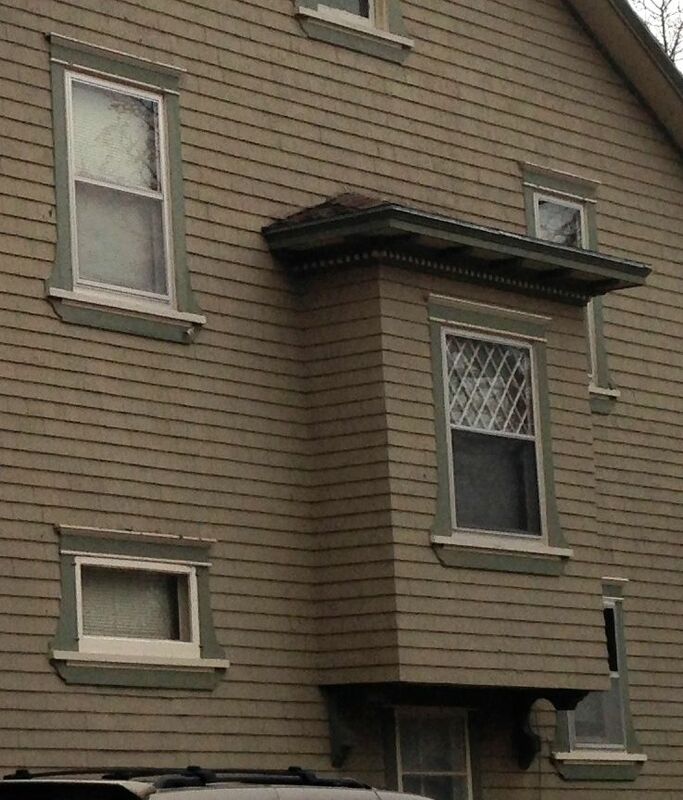 Note how the walls of the attic level curve in to meet the window. Typical Squires. First Presbyterian Church, Emporia, Kansas, by Charles W. Squires in 1897. 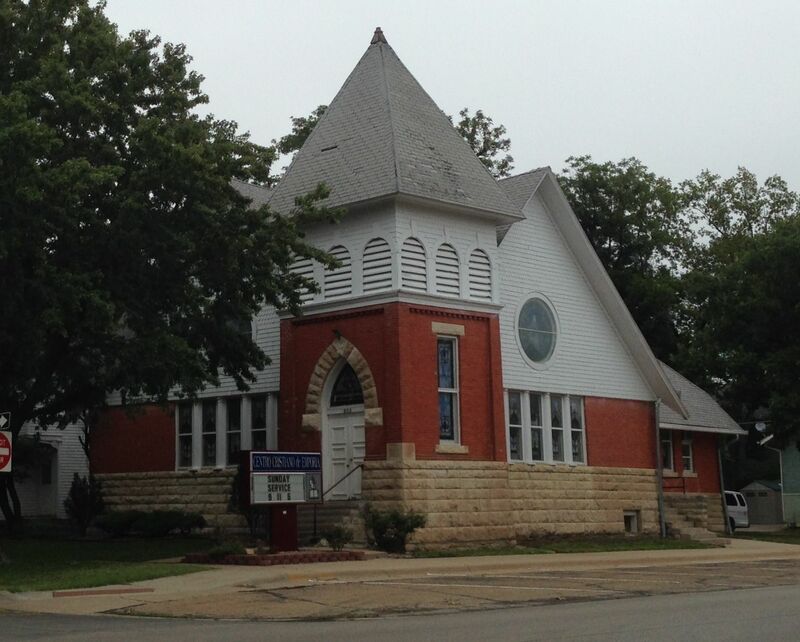 Another Squires-designed church at the corner of Ninth and Constitution, Emporia, Kansas. An almost identical design. 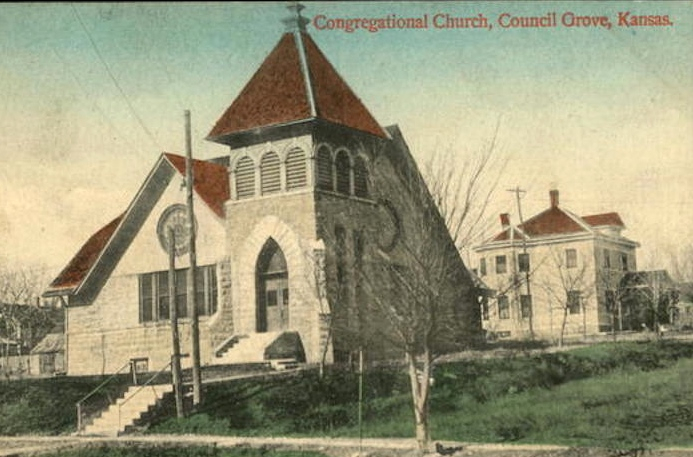 The First Congregational Church in Council Grove, Kansas, designed by Charles W. Squires. 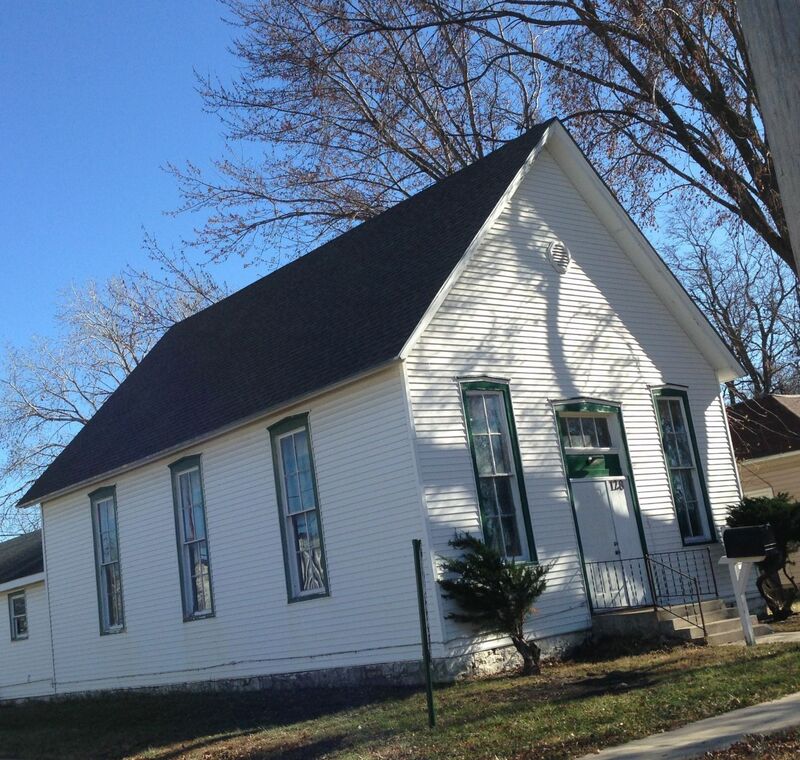 This church is at the corner of Second and Merchant in Emporia, Kansas. 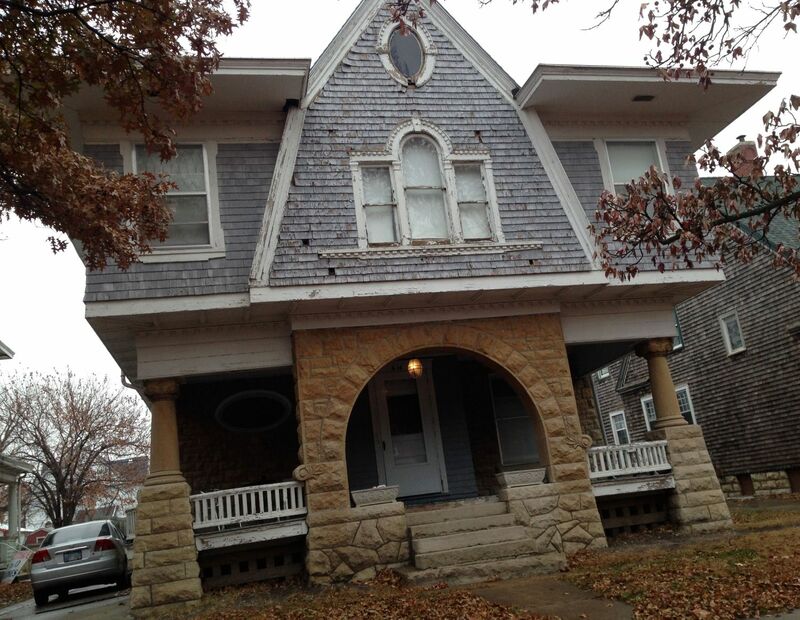 The structure seems an unlikely Squires design but A Guide To Kansas Architecture confirms this. 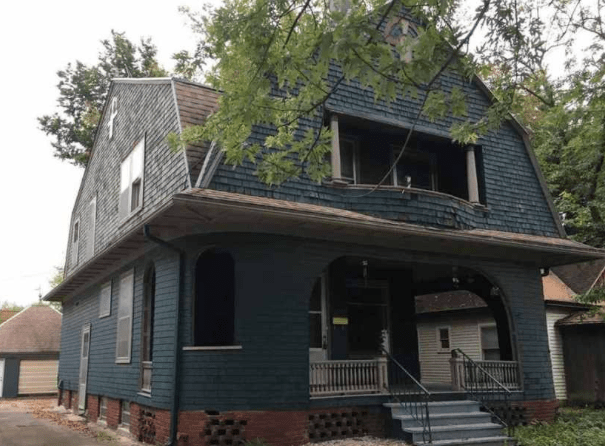 The church is likely a very early Squires creation, on a budget, and the vinyl siding may well hide some interesting details. Anderson (Carnegie) Memorial Library (NRHP 1987), 1902, Emporia, KS, by Charles W. Squires. 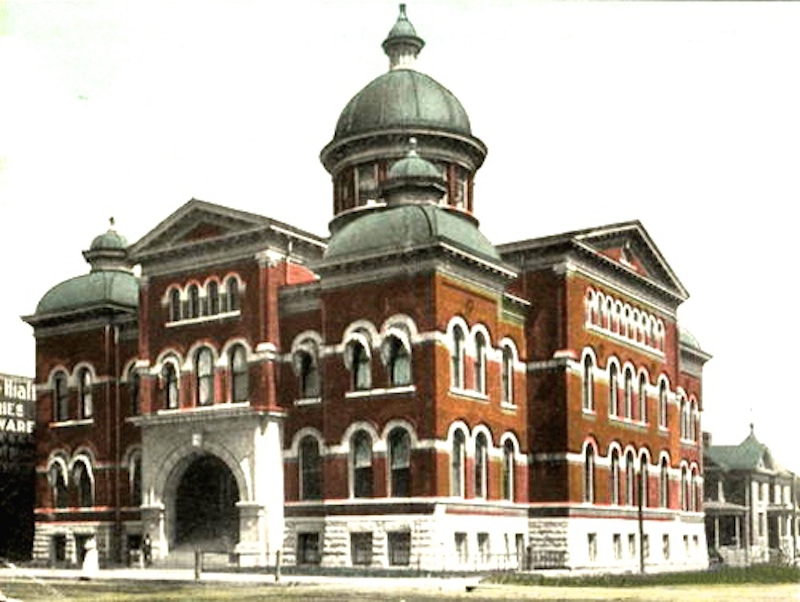 The 1901 Lyon County Courthouse by Charles W. Squires. Tragically, this structure was replaced in the 1950s by another courthouse. Today, this structure would be treasured. 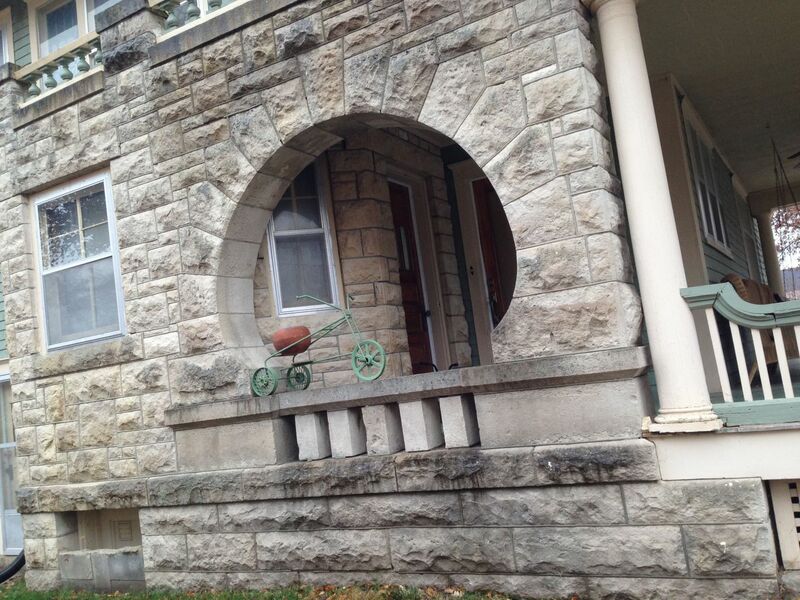 NOTE: The stone entry arch was relocated just east of the city on private property. 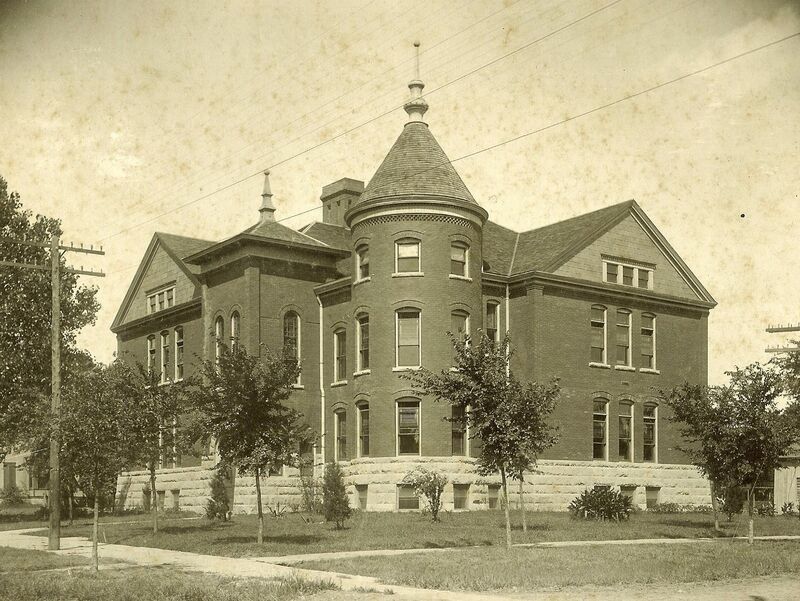 The Century School, 1900, Emporia, KS, by Charles W. Squires. Demolished. The Century School was on the NE corner of Tenth and Commercial. Greenwood Hotel (NRHP 2006), Eureka, KS, by Charles W. Squires. Brettun Hotel in Winfield, Kansas, by Charles. W. Squires. I do not know if the structure is extant. 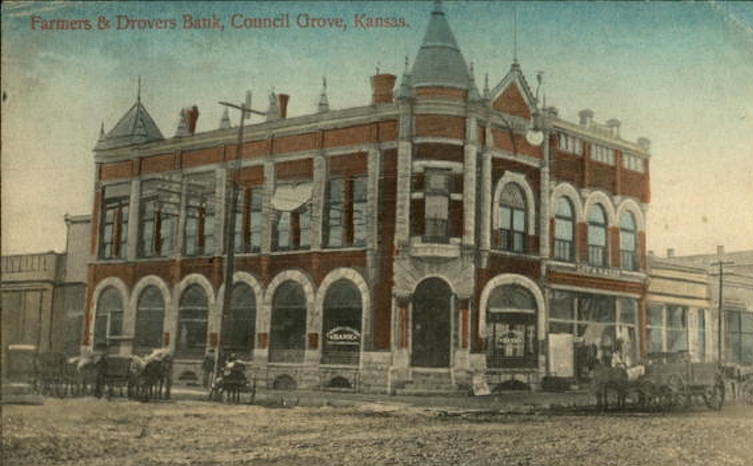 Farmers & Drovers Bank (NRHP 1971), 1893, Council Grove, KS, by Charles W. Squires. In an astonishing coincidence, Farmers & Drovers financed my purchase of the Cross House. City Building, Peabody, KS, by Charles W. Squires in 1887. Lincoln County Courthouse (NRHP 1987), Lincoln, KS, by Charles W. Squires in 1900. 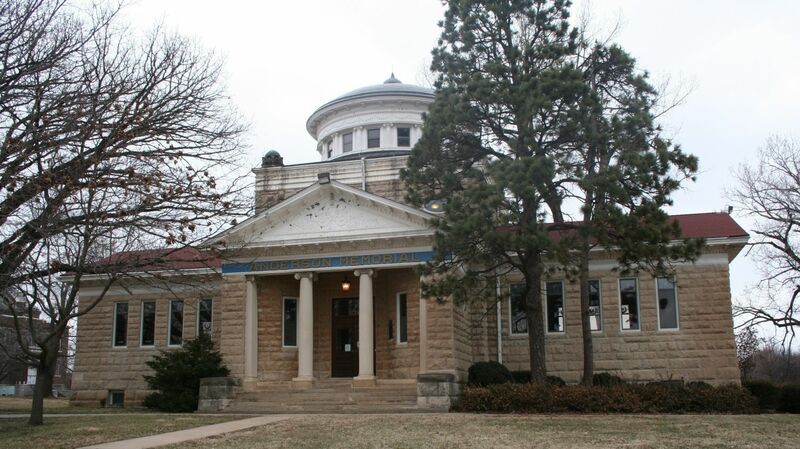 Hutchinson Carnegie Library (NRHP 1987), Hutchinson, KS, by Charles W. Squires in 1904. Round shapes. Usually a tower, a rounded bay, and/or round/oval windows. Exterior walls of lap siding (first floor) and cedar shakes (upper floors). Stamped tin belt courses and cornices. 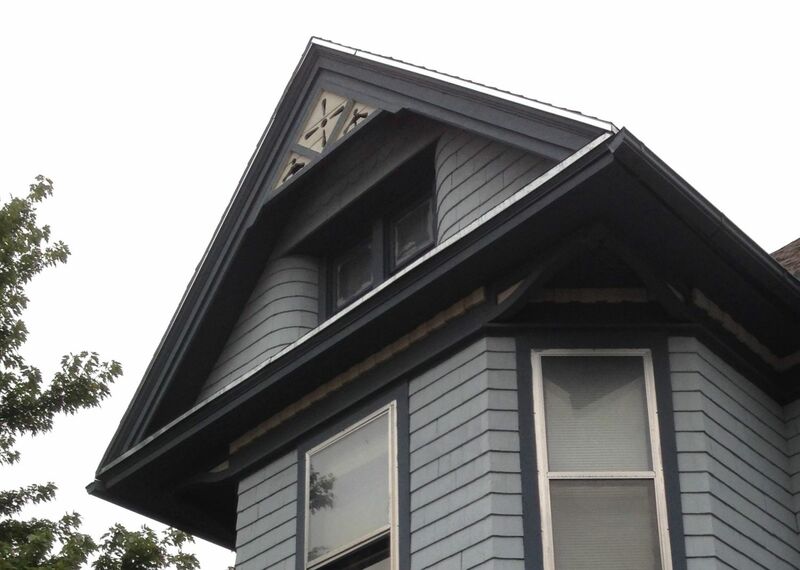 Exterior double brackets at the corners of bay windows. Cut stone. The man loved cut stone. 818 Exchange. 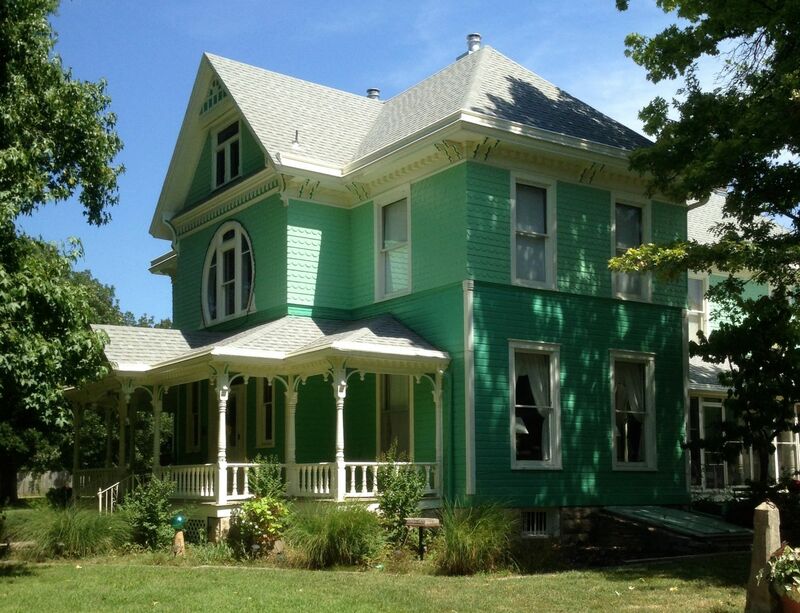 One of the most delightful houses in Emporia. 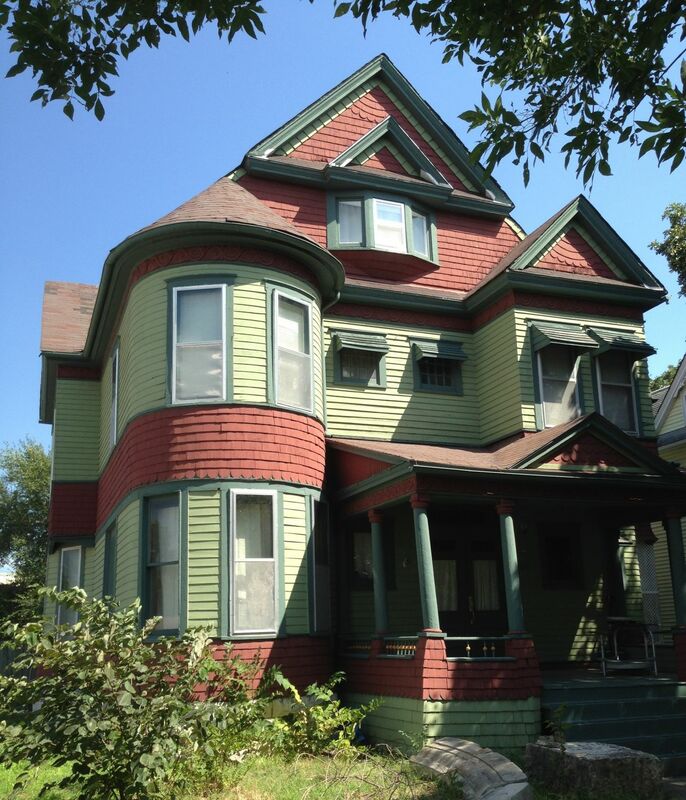 You can tour it on Old House Dreams. 628 Exchange. 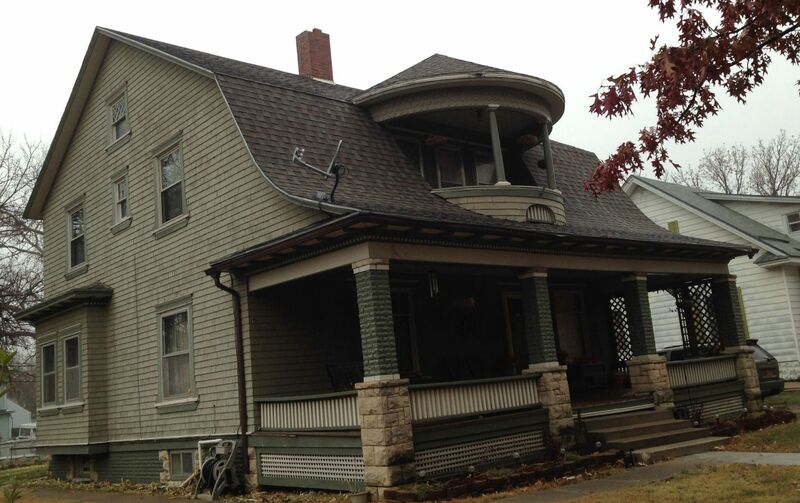 This house is across the street from the Squires “trio” shown above. At a glance this home does not seem Squires like. But let’s take a closer look. Buildings by Squires tend to exhibit a certain exuberance, and unconventionality. 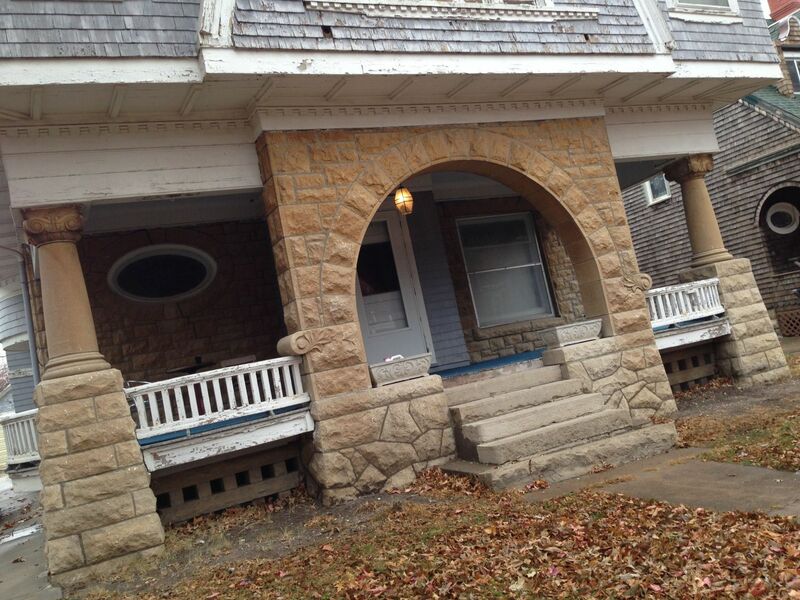 While this house seems normal enough, note the rounded stone arch to the left. Why is it there? And Squires love a good round. 628 Exchange. Wow. Yet there is no reason for this expensive arch. Except that it looks great. Oh, and Squired loved cut stone. 628 Exchange. See the three stone columns? So, why do two of the stone columns have wood columns RIGHT NEXT TO THEM? There is absolutely no reason for this. Except it looks great. This kind of eccentricity is typical of Squires. Ya’ gotta love the man! …1214 Exchange. For a small house, it abounds with mansion-like details. I have a post on this house. 526 Exchange, Emporia, KS. The home is one block due east of the Cross House. I have a post on this house. This very very small house is on the same block as the Cross House, to the south, RIGHT on the alley, and behind another, much older house. This small house is an in-fill. 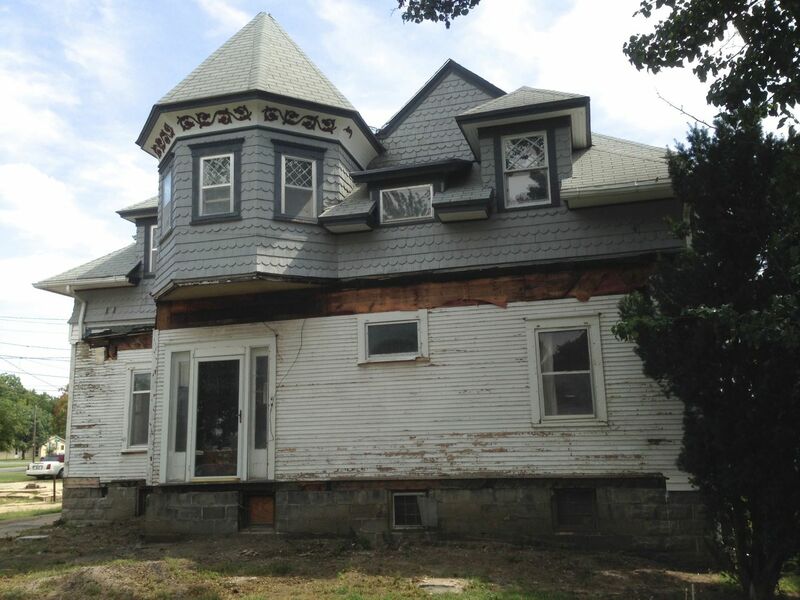 Typical Squires details include the “tower”, the lap siding on the lower level with shingles above, and the overall massing/scale. 911 Union. I have a post on this house. 614 Union. This knock-out is two houses directly north of my Cross House. Tell-tale Squires signatures include the cut stone, the dentil trim, and eccentric detailing (like, why does the sill for the upper middle window extend WAY past the window?). 614 Union. The stone-work is simply too delicious. Note the oval window. 614 Union. Note the dramatic, thrilling roof overhang, and oval window at the very top. 614 Union. The north facade. While the second floor is (mostly) a simple rectangle, the main level juts out eccentrically here and there, and delightfully. Note also how the porch railings are not straight, as might be expected, but have a gentle curve. NOTE: Surreally, this house has an incredible custom-made 1950s kitchen. The owner of the home told me I was the only person who liked it! And, trust me, it is fabulous. 618 Union. This house is directly to the north of the house shown above. Signature Squires elements include dentil details, a rounded corner, cut stone, and an eccentric, ah, molding of form. Old House Dreams did a post on this house. ….goes in and out and in and out and in and out! Like its neighbor right next door. I love the rounded bay. Delicious outside AND inside. Note also the gorgeous cut-stone foundation. 507 Union. This house is just south of my Cross House, and across the street. Squires signatures include the two oval windows on the south facade, dentil detailing (not readily obvious in the image), and, significantly, the sweeping curved upper porch. One simply does not normally see this. 507 Union. Being on the upper porch is thrilling, as the sweeping curve is really impressive up close. Also, quite remarkably, the lower porch railings and lattice appear to be original. 810 Mechanic. I have a post on this house. 701 West Street. As with 507 Union (above), I cannot think of any other Emporia architect who would have created such an extraordinary upper porch other than Charles Squires. 701 West Street. 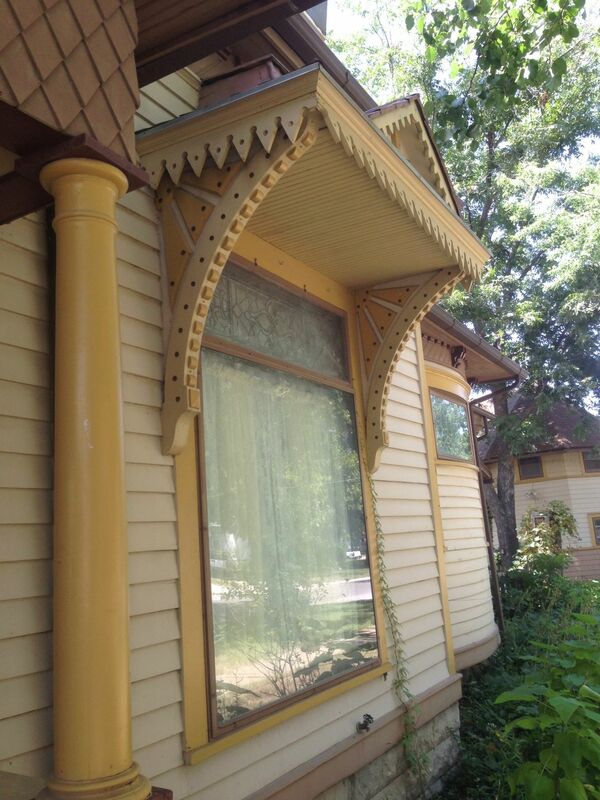 The window bays on the house, and porches, have dentil trim, a typical Squires touch. Note also the extremely unusual trim around the windows. This, too, suggest Squires. Indeed, who BUT Squires would come up with such distinctive trim? 702 West Street. 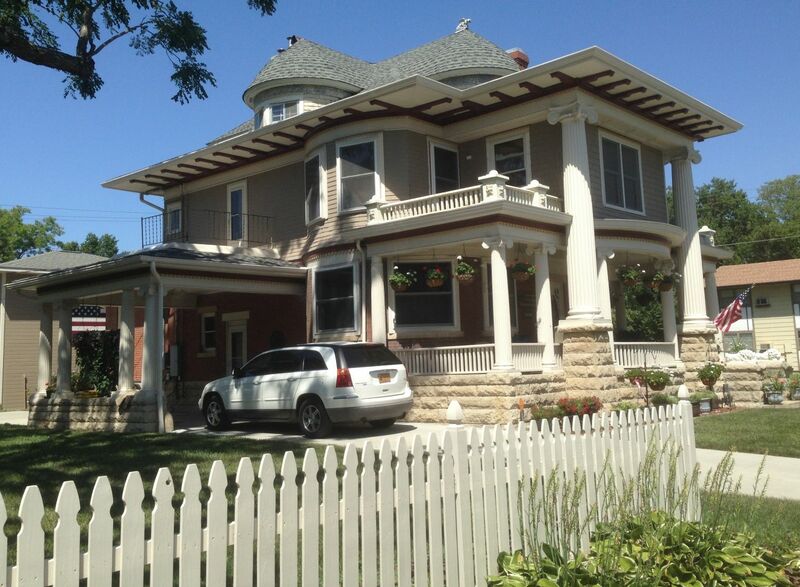 This house is across the street from 701 West, above. At first glance 702 does not have any signature Squires design elements. A closer look reveals otherwise. I have a separate post on this house. 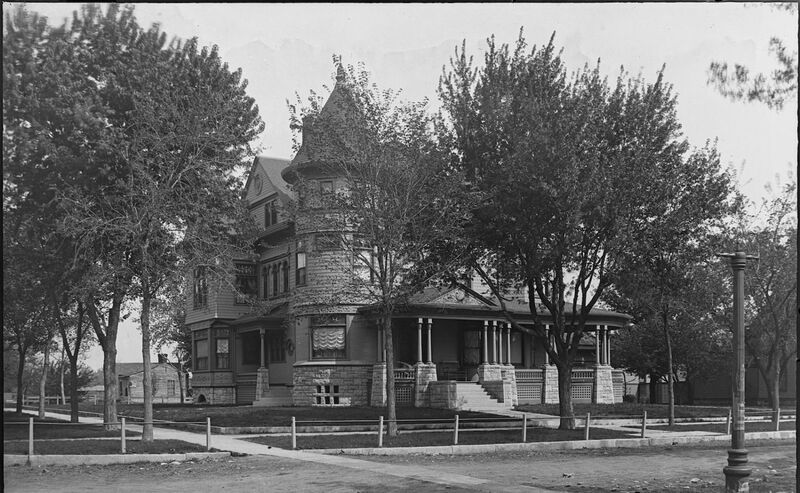 G. W. Newman House (demolished), 12th and State, Emporia. Kansas. 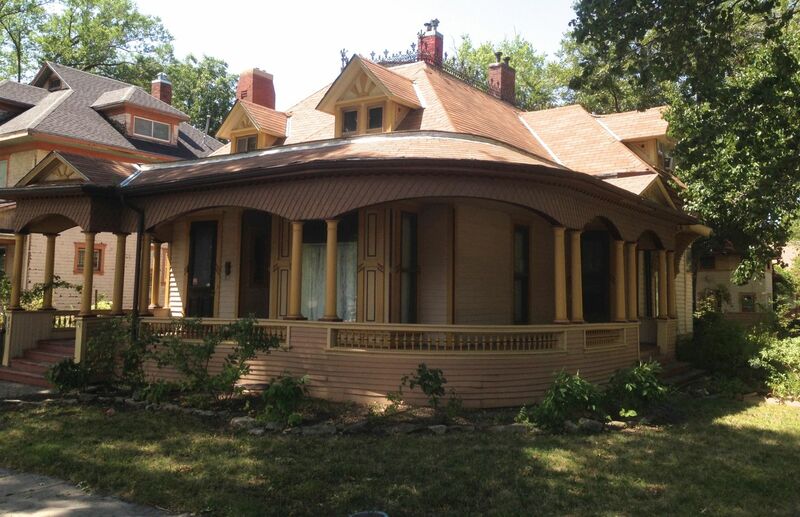 Like my Cross House, this home had round- and octagon-shaped towers, paired porch columns, similar scale and massing, and a combination of lap siding and shingles. A stunning home, comparable in scale and quality to the Cross House, and with an extraordinary carriage house (right side of image), its demolition was a tragic loss for Emporia. Newman owned the well-known Newman’s Department store on Commercial; the structure is extant. I have a post on the house. 810 Market Street. While the exterior has no signature Squires design elements, the interior abounds with Squires. I have a post on the house. In addition to the homes above, I have come across more than a dozen homes in Emporia with highly distinctive, similar details. The homes are clearly by the same architect, and I believe this was Charles W. Squires, as explained in another post I have written. Lloyd and Loretta Lowther (my great great grandparents) lived at 617 Exchange. My grandfather told me once while we were parked in front telling me it’s history, that it had such bad termite damage when he was in his teens, that they had to replace the entire 1st floor. He said he could stand in the doorway and look to the basement. Not sure of the accuracy, but interesting none the less. I looked up the Keebler-Stone house this morning and found your posts, research, and pics…lovely! A friend and I are tentatively planning a trip in the not-too-distant future to include the area and look at the houses. I wondered if you lived in the area, and if so – assist with a tour? Or perhaps could be persuaded to…? Please advise. 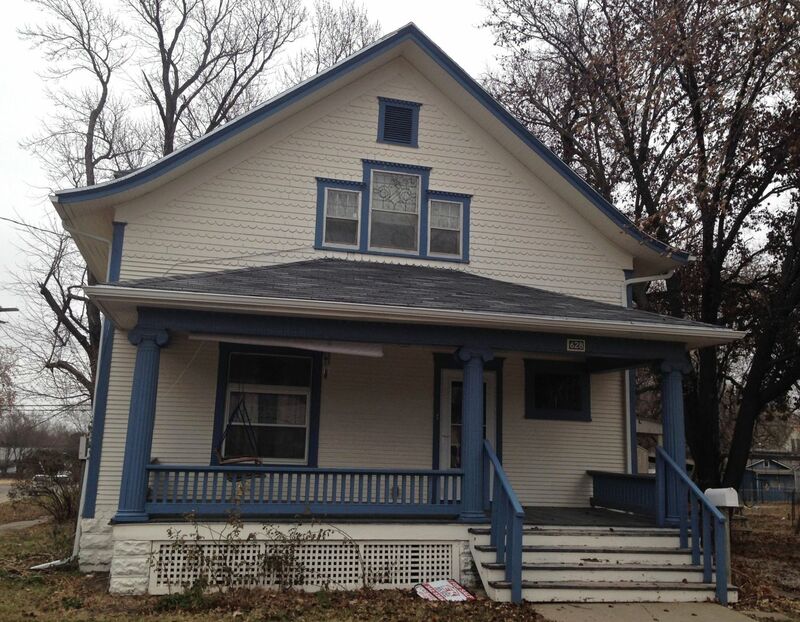 Have you looked at 526 South Commercial? It’s currently for sale. I went and looked at it, and loved not only envisioning what it use to be, but what it could be again. Some of it was pretty hard to figure out for a novice such as myself given it use to be 5 apartments. I was curious if it could have been a Squires design? If ever not busy (lol) you should check it out! Hi Sarah! It is hard to get excited by a listing when there is but a single image! I know! But! My friend and I called Lacy and she showed it to us. Sorry, I forgot to mention I physically went there. Lol. Yes. It definately doesn’t look like much from the picture. But if you go see it in person. Maybe you might see something a bit more. It has stained glass. Badly in need of repair. 12 foot ceilings and pocket doors. The entryway stairs kinda reminded me of the cross house. 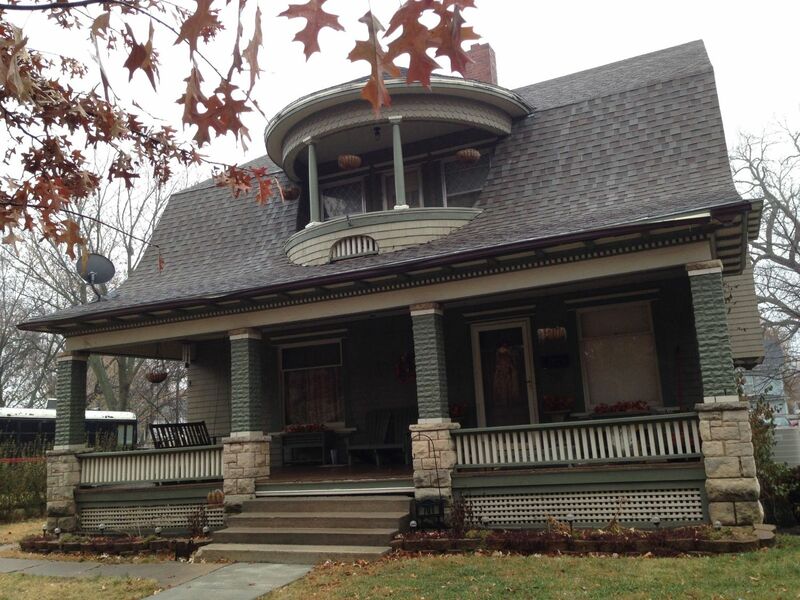 The front porch has crazy mismatched columns that I couldn’t make sense of. A servants staircase made me wonder where the butlers pantry originally was. There are cabinets upstairs that seem to taken from the original kitchen (wherever that was) and I guess it’s just such a puzzle to me that I wanted to have your amazing take on it. And the basement? If one could be in awe of a stone walled basement I was! And a randome pie safe down there and me saying. Hmmm. 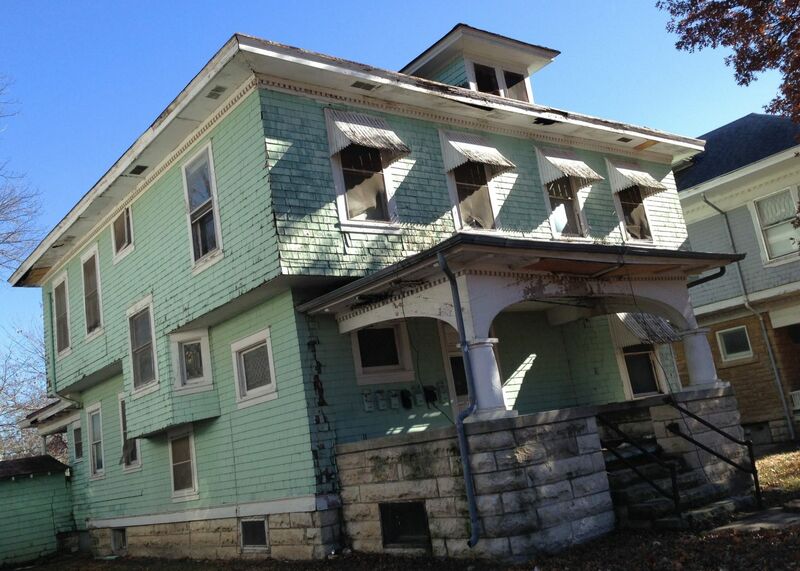 I know I have my hands full but this house would be a blast to restore. Starting with saving the stained glass! Poo! Why didn’t you invite me on the tour???????? Sorry! My friend asked and you seem like a busy guy! Haha! Bit while walking through I just kept telling my friend, wonder what Ross would make of this. And this would make Ross say whooee! And is there such a thing as 15 ft ceilings cause I think the pocket doors were 12. Everything seems grander when I think back. Which is so strange that the inside would look like it does when the outside looks kinda farmhousey. Would it have been a stick. Victorian under that siding? Let me know if you ever want to go! Would definately walk it with you! Have you guys been to Parsons to see the Presbyterian Church? It’s amazing. I’m looking forward to seeing more Squires work. 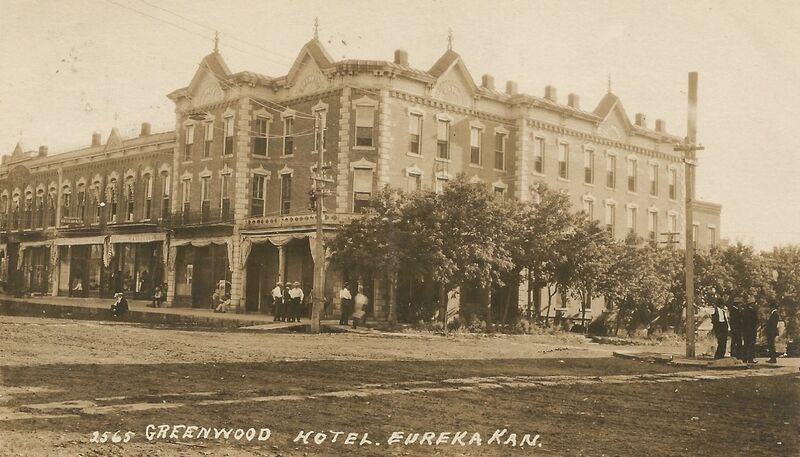 Just stopped at Eureka yesterday too see the Greenwood Hotel. 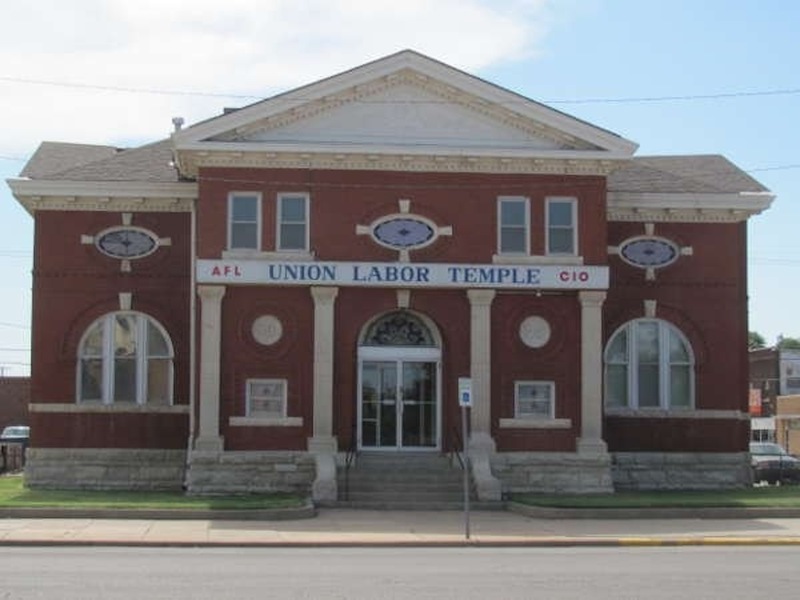 I grew up in Parsons and I’m looking into historical Ks architecture. If anyone has some information or links, that would be great! I will get some photos. Do you know if his designs may have gone to St. Joseph, MO.? 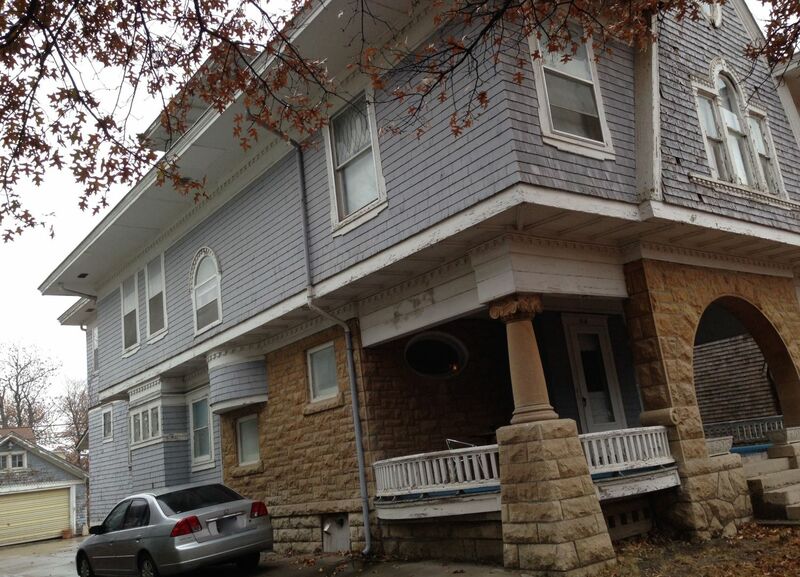 I was reading through this post again and it made me wonder about 988 Leavenworth Street, in Manhattan, Kansas. I had a friend who lived in one of the apartments when I was in college there in the early 1990s. Check it out on Google Streetview. 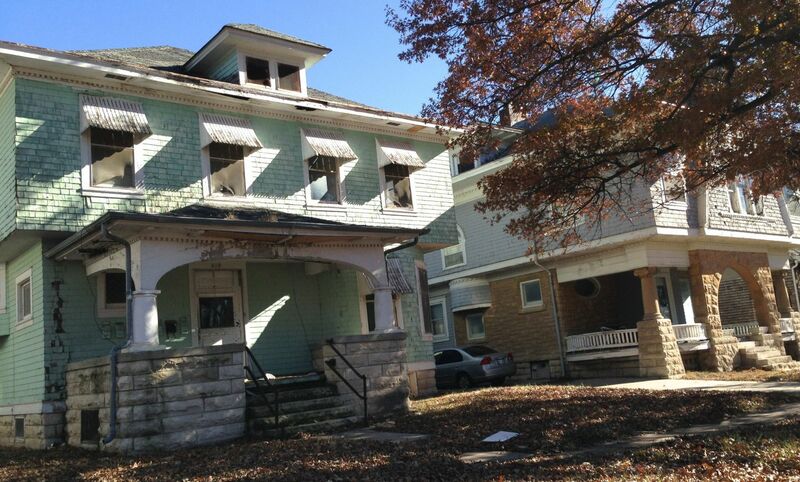 It seemed as if it was purpose-built as a four-plex, from what I recall. 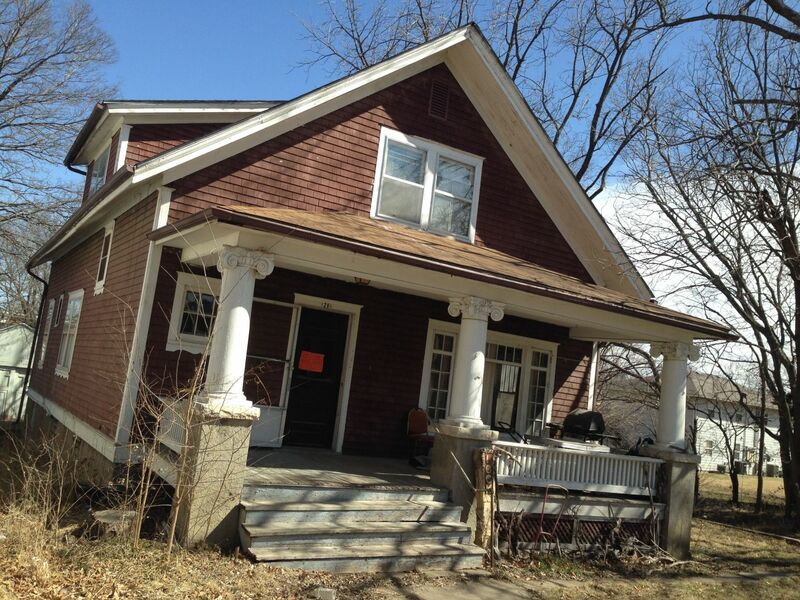 But it does have the grouped columns on the porch and a gently rounded side room you can see in Streetview. For that matter, the house across the street has quite the tower on it… I wonder if Squires built in Manhattan? It’s certainly well within the region where he was so active. 614 Union! I love that house!! 335. 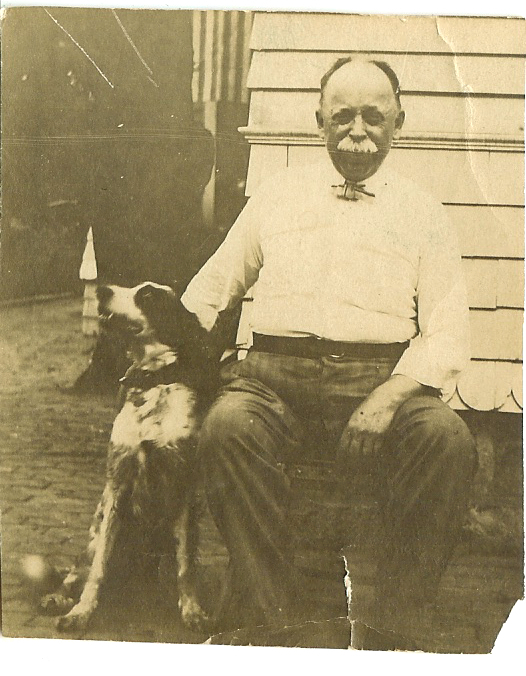 CHARLES WESLEY (5) SQUIRES (Wesley H. 4 #226, Nicholas 3, Seth 2, Ellis 1) (February 5, 1851 – December 24, 1934) was raised in Good Ground (now Hampton Bays) Long Island. The 1870 census reports that he was a store clerk during that year. 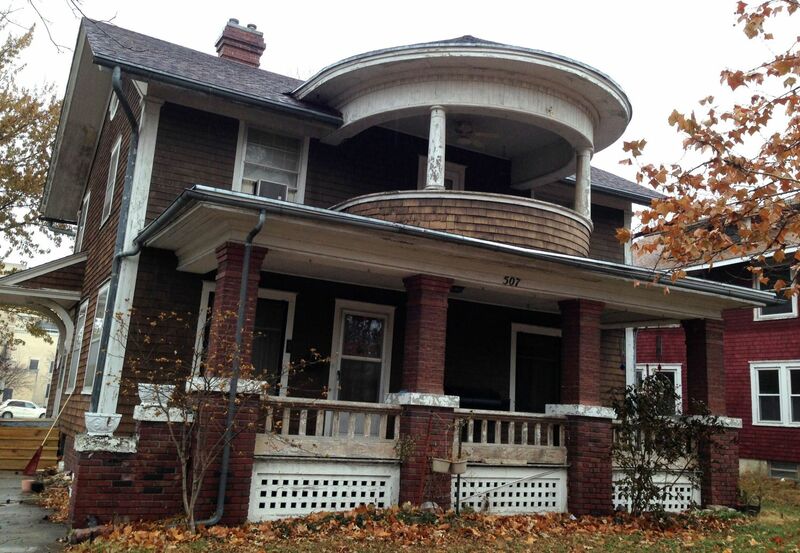 Later that year, at age nineteen, Charles traveled to Columbus, Ohio to study architecture. He remained there for four years, returning to Good Ground only for a visit in July of 1874. His moved, about 1876, to Fort Wayne, Indiana and about 1877 to Springfield Illinois. In 1879 he returned to Columbus, Ohio until he relocated to Emporia, Kansas on September 29, 1879. 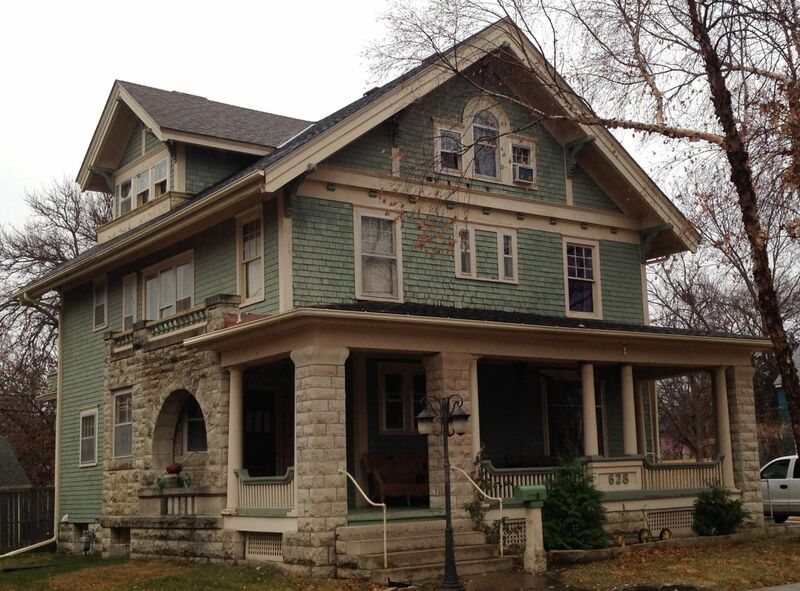 In 1880 he lived with another architect and his family in Emporia. Charles married, at Fort Wayne, Indiana, on December 27, 1881, Susan Howey (1856 – August 28, 1933). Susan was born in Illinois. By 1910/11 he had become a builder/architect/superintendent in Emporia, Kansas and designed many private and public buildings throughout the Midwest. 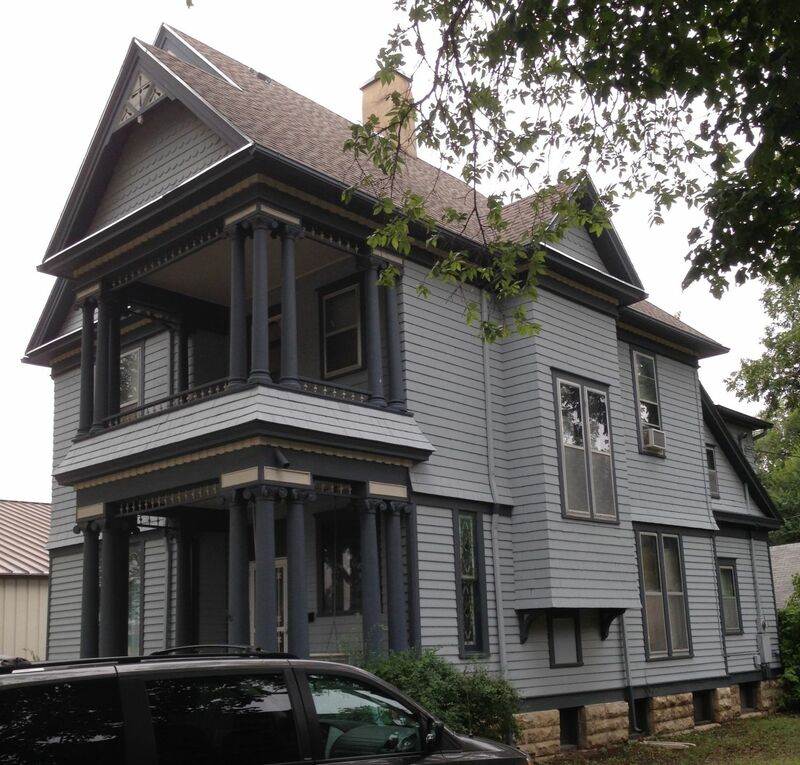 It is said that he also designed many private residences for prominent Emporia citizens and that at the time of his death those houses were still as sturdy and beautiful as they were when they were built, many of them listed in the National Register. He remained in Emporia for the rest of his life. His first year’s work was principally on the private residences of Dr. J. A. Moores, William Jay, one now occupied by P. B. Plumb, built for N. W. Weaver, and many others. 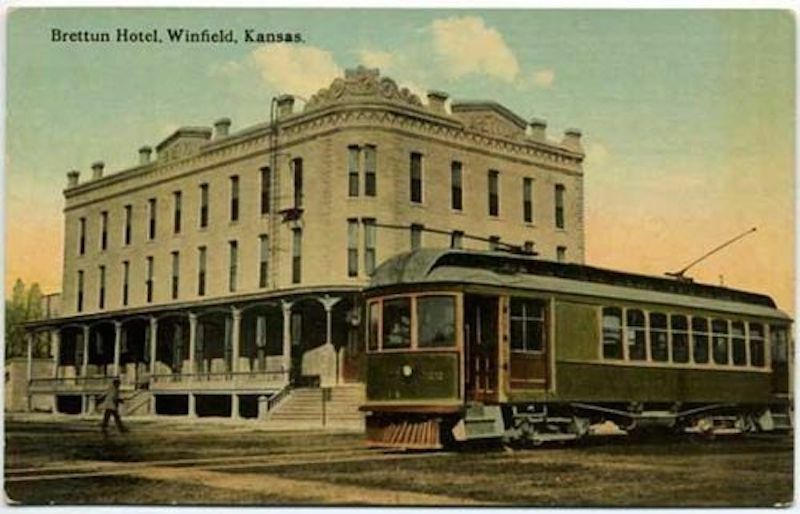 In 1880, he designed and built the Emporia High School, the Brettun Hotel at Winfield, the I. O. O. F. Hall at Emporia, the Telegram building at Winfield, and the Burlington Hotel. In 1881, the Howard Public schoolhouse, the Fifth Avenue Hotel of Emporia, the Catholic Convent, the Osage County Bank, at Osage City, and the Whitley Opera House at Emporia. 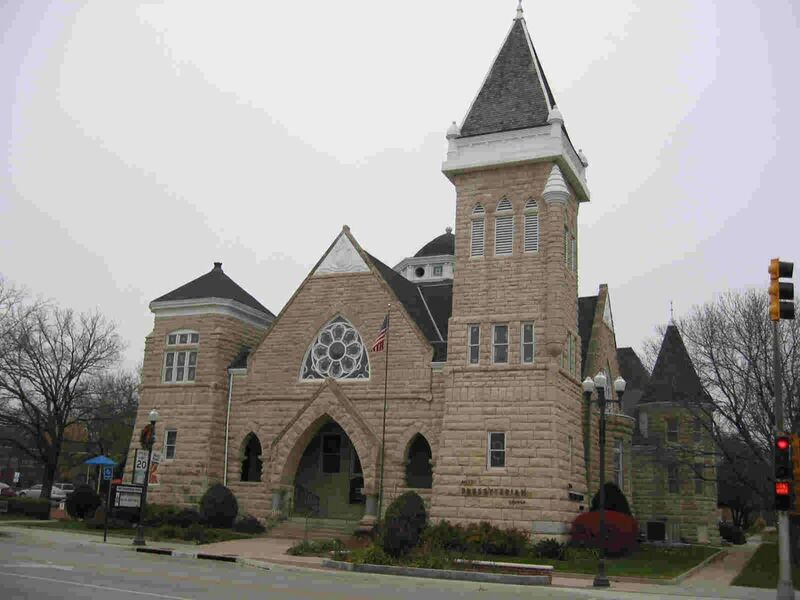 In 1882, a public schoolhouse, at Council Grove, and one at Florence, Second and Fourth wards schoolhouses at Emporia, the Welsh Congregational Church at Emporia, a hotel at Eureka, and many residences. According to his obituary in the Emporia Gazette, Charles designed 2,700 buildings in Kansas throughout his career. 1. Dwelling 1394, family 1498, Wesley Squires age 38 shipmaster, value of real estate 500, value of personal estate 1000, Sarah Squires age 28. Charles, age 7, Leverette age 2. 1860 Census for Town of Southampton, Good Ground, taken the 18th day of July, 1860. 2. Squires, Charles W., age 14, child of Wesly H. 1865 N.Y.S. Census [A–43 in text]. 3. Squires, Charles W., age 28, clerk in store. 1870 Census, Good Ground [A–44 in text]. Chas. W. Squires, oldest son of Capt. W. H. Squires has just arrived from Columbus, Ohio where he has been for the past 4 years. 5. 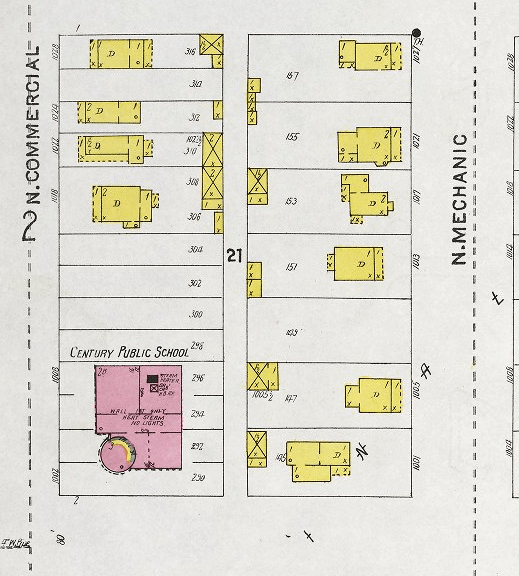 Dwelling 32, family 39, Squires, Charles W. , Architect. 1880 census for Emporia Kansas taken the 5th day of June, 1880. 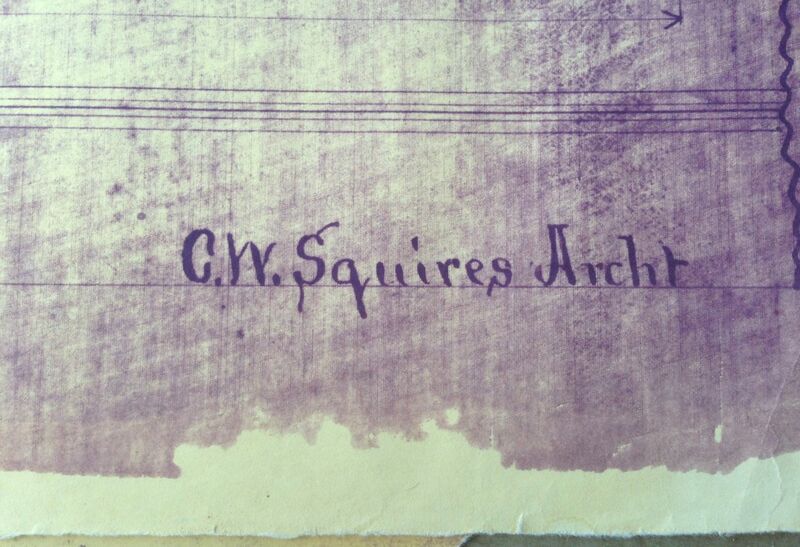 CHARLES W. SQUIRES, architect, came to Emporia, September 29, 1879. His first year’s work was principally on the private residences of Dr. J. A. Moores, William Jay, one now occupied by P. B. Plumb, built for N. W. Weaver, and many others. 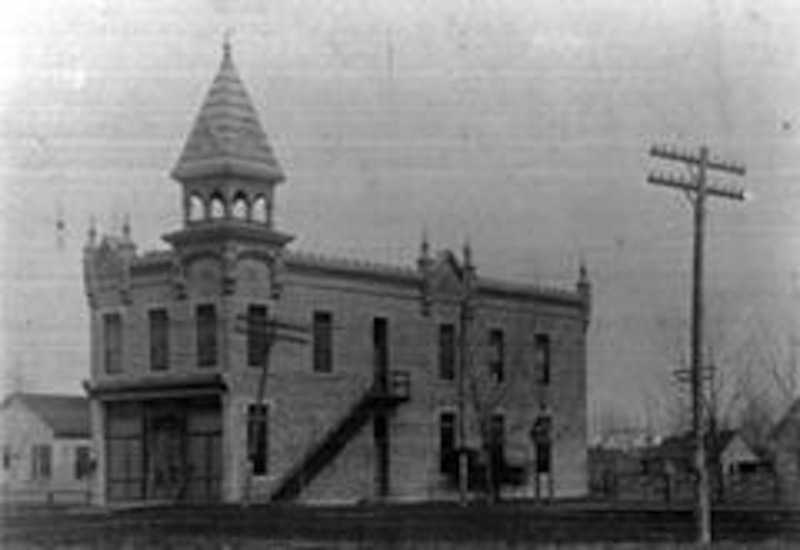 In 1880, he designed and built the Emporia High School, the Brettun Hotel at Winfield, the I. O. O. F. Hall at Emporia, the Telegram building at Winfield, and the Burlington Hotel. In 1881, the Howard Public schoolhouse, the Fifth Avenue Hotel of Emporia, the Catholic Convent, the Osage County Bank, at Osage City, and the Whitley Opera House at Emporia. In 1882, a public schoolhouse, at Council Grove, and one at Florence, Second and Fourth wards schoolhouses at Emporia, the Welsh Congregational Church at Emporia, a hotel at Eureka, and many residences. Mr. Squires was born in Southampton Township, Long Island, N. Y., February 5, 1851, and lived there until 1870, was nineteen years of age when he went to Columbus, Ohio, which was his home for six years. 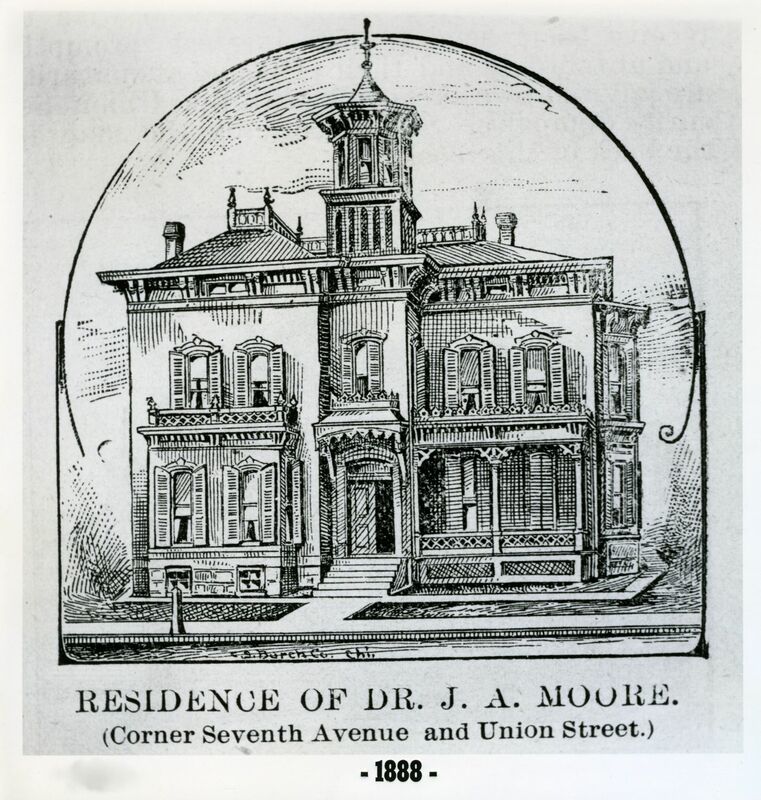 Fort Wayne was then his home for two and a half years, after which, in 1877, he removed to Springfield, Ill. 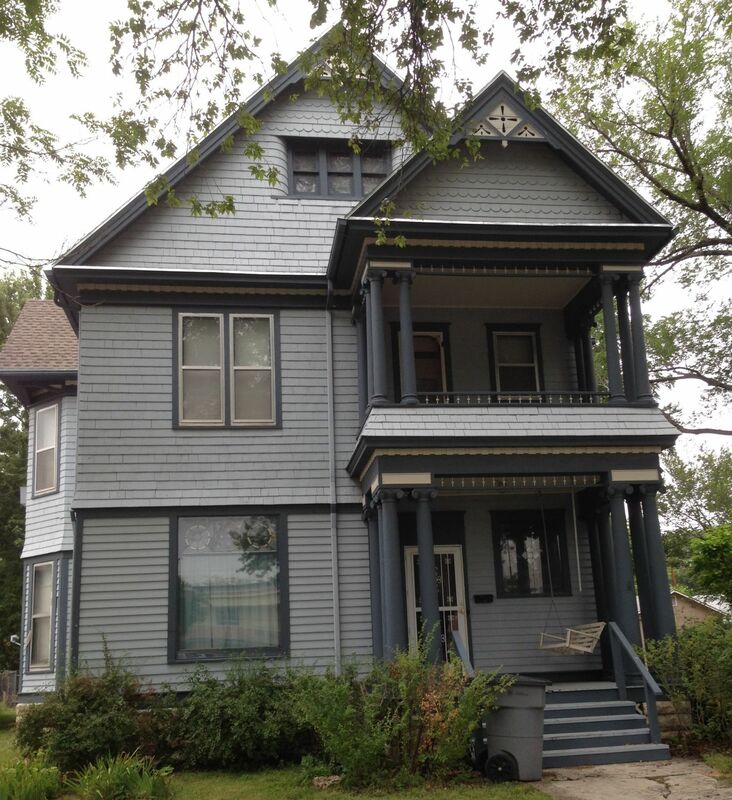 In 1879 he returned to Columbus, Ohio, and made that place his home until he came to Kansas. He commenced the study of architecture at Columbus in 1870, and has practiced it as a profession ever since. He was married at Fort Wayne, Ind., December 27, 1881, to Susan Howey, a native of Illinois. 7. 613 Market Street, Dwelling 311, family 327, Squires, Charles W., father, b. Feb. 1854, age 46, married 18 years, b. N.Y., parents b. N.Y., architect; Squires, Susan, mother, b. June 1858, age 41, married 18 years, 3 children, 2 alive, b. Illinois, father b. England, mother b. Pennsylvania; Shirley, daughter b. Jan. 1874, age 16, single, b. Kansas, father b. New York, mother b. Illinois; Squires, Anna, daughter, b. 1889, age 10, b. Kansas, father b. N.Y., mother b. Illinois. 1900 census – Emporia County, Kansas, taken the 13th day of June 1900. 8. 613 Exchange Street, dwelling 127, family 131, Squires, Charles W, age 56, b. N.Y., married once, 28 years, architect and superintendent; Susan, age 50, b. Illinois, wife, father b. England, mother b. Pennsylvania; married 28 years, 3 children, 2 alive; Shirley, daughter, age 25, b. Kansas, stenographer in real estate office; Nash, William C., son in law, age 35, b. Minnesota, father b. United States, mother b. United States, theatre, moving pictures; Anna S., wife, 20, b. Kansas, married once, no children. 1910 census for Emporia, Lyon County, Kansas, all south of Center 9th Avenue, E.D. 51, page 5B, lines 63-67, Roll 445. 9. East Hampton-Southampton Register, 1910-11, Census of Good Ground, p. 276. 10. 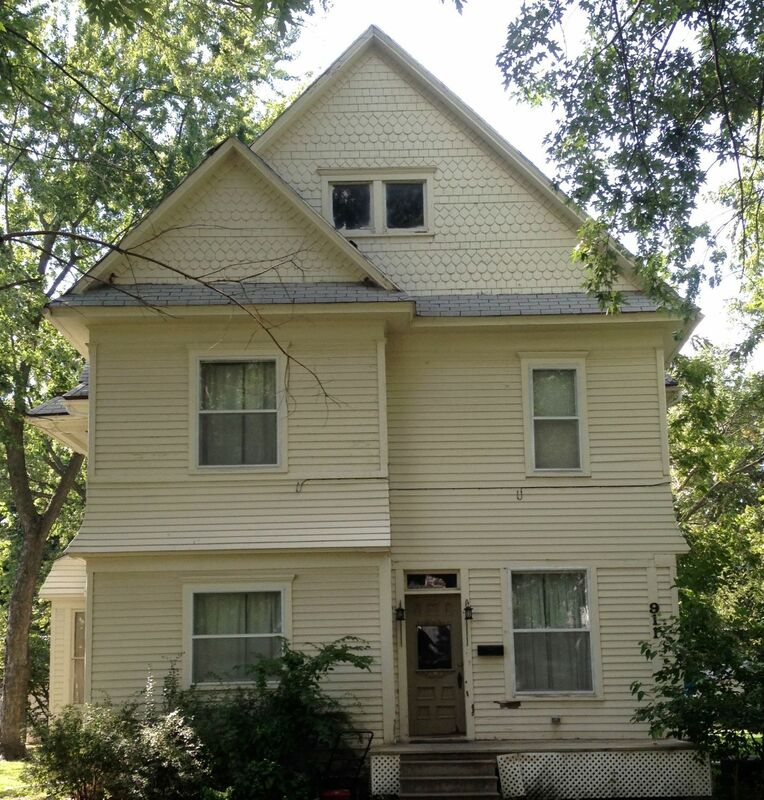 613 Exchange Street, dwelling 125, family 129, Squires, Charles W., age 68, b. N.Y., architect in an office; Susan, wife, age 57, b. Indiana; Nash, W.C. son in law, age 46, b. Minnesota, oil promoter in oil field; Anna, wife, age 35. b. Kansas; Chas. W., grandson, age 2 8/12, b. Kansas. 1920 census for Emporia City, Lyon County, Kansas, taken 10 Jan. 1920, ED 55, sheet 5B, lines 54-58, Roll 538. 11. 613 Exchange Street, Dwelling 336, family 351, Squires, C. W., head, owns home, value of real estate 15,000; age 79, age at 1st marriage 30; Susan, wife, 72, age at 1st marriage 25; Nash, Anna, daughter, age 40, widow, age at 1st marriage [not given]; Charles W., grandson, age 15, 1 roomer. 1930 census for Lyon County, Kansas, Emporia Township, taken April 14, 1930. 13. Harry Squires and death dates of Charles W. and Susan Howey Squires from the Family Record of the Nicols Squires’ family, contributed by Richard Casabianca. See #182.